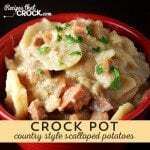 Do you love country-style potatoes? Let your crock pot do the work for you! Cover and cook on high for 3 1/2 hours, you want your potatoes "fork tender"